A stunning 4 double bedroom family home with private indoor pool; remodelled and beautifully refurbished 4 years ago, it is arranged over 3 floors and features a host of innovative eco-features that minimise running costs greatly. These include a ground source heat pump connected to two 330' boreholes, 14 photovoltaic panels, additional insulation and cavity wall in-fill, double and triple glazing with under-floor heating. It also has 3 bathrooms incl. 2 en-suites, a stylish spiral staircase, cloakroom and open plan living/dining room with adjacent kitchen. Outside there is a large double garage, a drive and delightful southwest facing garden. It is set in a quiet close of this sought after village just over a mile from Wallingford town centre. The property has under-floor heating supplied via a ground source heat pump connected to two 330' boreholes, 14 photovoltaic panels and is double/triple glazed throughout. 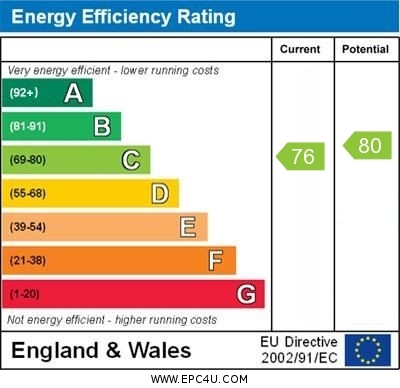 External cavity walls have been in-filled, electric and plumbing systems re-done to latest standard 4 years ago. Coherent theme in bathrooms and cloakroom and light maple wood throughout. Electric radiators in the 2 en-suites and a fitted wood burning stove in the sitting room for additional comfort. Entrance Hall: Corridor with side cloakroom: White 2-piece suite, stylish tiling, internal window and down LED lighters. Pool Room: 15’3 x 12’2 Automatically filtered and heated swimming pool made of fibreglass with remote controlled swimming jet and insulating cover, paved surround and cover, lit through a large glass roof and LED down lighters. Dining Room: 12’3 x 9’11 Tiled with under-floor heating, French doors and side windows to timber decking and the garden. Kitchen: 12’5 x 9’1 Window to rear and door out to side walkway, range of light maple storage units with worktops, induction hob with extractor hood, electric oven, high end dishwasher and recess for fridge/freezer, tiled with under-floor heating, ground source heat pump providing hot water and heating.Spiral Staircase to First Floor Landing: Heated hard wood maple floor, large cupboard. Bedroom 2: 11’11 x 10’11 incl. wardrobe. Window to front, heated hard wood maple floor, range of light maple fitted wardrobes. En Suite Shower Room: White 3-piece suite including a large, tiled low profile walk in shower enclosure, heated maple floor, window, electric radiator for additional comfort, LED down lighters. Bedroom 3: 12’4 incl. wardrobe x 8’11 Heated hard wood maple floor, window to rear (triple glazed) large wardrobe recess. Bedroom 4: 10’4 x 9’4 Triple glazed window to rear, heated hard wood maple floor. Shower Room: White 3-piece suite that includes a large low profile walk-in shower enclosure, window, heated maple floor, down lighters. Recess for washing machine with shelves above. Comprising a luxury master suite - Dressing Area: Window to side, hard wood maple floor, range of light maple wardrobes, eaves access to additional storage. Feature gable window (triple glazed) to rear fields, two recesses flank bed space, hard wood maple floor, two eaves cupboards access further storage. En Suite Shower Room: White 3-piece suite including a large, tiled low profile walk-in shower enclosure, hard wood maple floor, access to extra storage eaves cupboard, Velux window, electric radiator for additional comfort, and LED down lighters. Front Garden: Double width drive, timber path to front door. Double Garage: 16’10 x 16’5 Two sets of twin doors, loft space, light and power, window to front. A delightful feature the garden faces south-west and enjoys an excellent degree of privacy. There is a large area of decking leading to a well maintained lawn with feature stone border and timber fencing across the rear and adjacent seating area. The lawn is flanked by side beds with mature shrubs and trees, side gate to front.